This pirate themed graphic organizer is designed for students to use when reading non-fiction text. As students read they record facts about the topic they are reading about. This sheet is designed for students in grades K-3 and has space for 3 facts to be recorded. 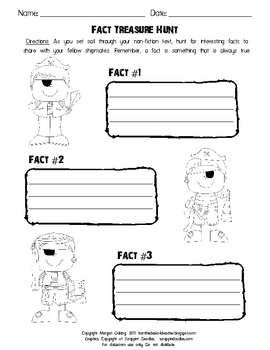 There is a whole series of pirate themed graphic organizers for non-fiction text coming, some which will be free. Be sure to subscribe so you don't miss them!